Wedding music was once about five guys in bow ties fronted by a long-gowned female vocalist. As time went by, it became more about the Chicken Dance and the Electric Slide. Well, roll up your sleeves, start the smoke machine and bring on the square-dance instructor, because just about anything goes on today's wedding music stage. As typical wedding music selections begin to resemble Top 40 lists from a bygone era, today's brides and grooms are trying to customize their big day's sound. JoAnn Gregoli, bridal consultant for New York-based Elegant Occasions, has seen it all - from jazz or reggae to blue grass band. She says: "We've had piano players with torch lounge singers performing and also retained choirs to sing along with a cappella groups from local colleges." Hank Lane, founder of Hank Lane Music based in Roslyn Heights and Manhattan, who has done his fair share of celebrity events, performing at the weddings of Donald Trump, Eddie Murphy and Vera Wang, thinks many brides and grooms "want more of a show business look." "A lot are eliminating the tuxedo with the back-up band, and they're putting them in black on black, more like you would see on the Broadway stages or in the clubs, or in music videos. And they're using multi-female vocalists ...the Christina Aguilera or Britney Spears look," he points out. Theme weddings, in particular, offer the perfect opportunity to experiment with alternative sounds. If you're into "The Great Gatsby" and 1920s jazz, why not strike up that ragtime band. You can hire a dance instructor to teach the Charleston and the Lindy Hop. In a different but still nostalgic mood, why not tune into the music of Cole Porter or Duke Ellington? Think steel drums for a tropical party, or a sitar for an authentic Indian feel. A quartet of strolling violins connotes an intimate affair, while a Dixieland banjo band might just be the ticket for your outdoor, around-the-campfire shindig. Last Halloween, Bret and Colleen Curran of Northport celebrated their nuptials at a grand, Victorian masquerade ball. Since they wanted their own personal style to be reflected in the music, they hired Tim Cody, owner of Alternative Sounds in Wantagh. "We knew Cody for years from clubs we'd gone to," says Colleen Curran. "When we asked him to do it, he was more than happy, because he likes different, more alternative stuff." Cody, a DJ purist who prefers turntables to CD players, brought his unusual repertoire. "It's not elegant and traditional all the time," he says, pointing out that a lot of his clients "grew up going to Spies, 007, Malibu, and I have a lot of that obscure, '80s new wave." The Currans chose a few traditional acts like James Brown, Elvis and the Beatles "for the older folks." But, says Colleen: "We mixed it in with our type of music, which is Goth and industrial." Starting with the older music earlier in the evening, as the evening progressed, they added edgier material. "By the end of the night, Cody was spinning a set he would have put on at a club. It was absolutely great. Nothing is more hilarious than watching my mom dance to Wumpscut." Cody agrees couples are looking for something different. "People call me up and ask, 'Do you have the Smiths and Depeche Mode?' I did a wedding last fall, and the bride and groom wanted new wave and glam rock, like Quiet Riot." Even for traditionalists, who like the idea of having a straight-up band or DJ, there are ways to customize an event, "The Internet makes it easier for brides to find very specific songs that mean something to the particular couple - certain lyrics or a certain melody," says Tim O'Neill, who, with brother Ryan, make up the Minnesota-based O'Neill Brothers, who have performed at more than 300 weddings. 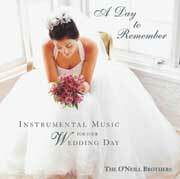 The duo's best-selling CD, titled, "A Day to Remember: Instrumental Music for Your Wedding Day, Vol. I," will be followed by a second volume in the coming year. "Really organized brides can even go online to some of the bigger wedding Web sites, such as theknot.com and weddingchannel.com or wedalert.com," says O'Neill, "and practically lay out all 50 songs for the wedding - or just pick your first dance." "A lot of couples also will incorporate a DJ with a band," Lane says. "Maybe the band will play just traditional music and stay away from contemporary stuff that's on the radio, which will be handled by the DJ." He adds: "Some are also doing an after-party, where the people will finish the entree and then go into another room at the venue, where it's set up more like a club with couches and furniture and then they'll have a DJ there." "The latest trend is driven by iTunes," O'Neill notes. "DJs no longer have to bring all their CDs when they show up at a reception. They just bring their iPod or laptop, with all their MP3s on it, so they have more versatility to flip through songs and take more requests from wedding guests." Some requests are not just unusual, but downright strange. O'Neill remembers one wedding where he was asked to play "Send in the Clowns" as the bride's mother and grandmother were being escorted in. "The bride really loved the song, but she never put it together," he says, laughing. "People usually can't name that tune. They just say, 'Oh, that's a great melody.' I decided to try to play the melody a little differently, so people didn't think I was crazy." Determine the parts of the ceremony that you'd like to set to music. You can select as little or as much music as you like, but select just enough so there are no "bare spots" during which your guests might become fidgety. Not all musicians are created equal. Select musicians who are comfortable with your chosen style. It all comes down to budget. The more musicians you have, the more you have to pay. Rather than paying a vocalist, a pianist and an organist, it's very possible that you can find one person, a multi-tasker, to do all three of those things. If the reception is held in a large venue, the music should complement the scale. An acoustic guitar, for instance, might get lost in a banquet hall.